areas are closed to cycling. The way you ride will influence trail management decisions and policies. creating new ones. Don't cut switchbacks. Be sure to pack out at least as much as you pack in. serious offense. Leave gates as you found them, or as marked. be hard to find. 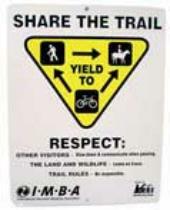 Being considerate of others and practicing good camp and trail etiquette ensures that everyone enjoys the visit. seconds if it is improperly tied and then sets back on the lead rope violently. Horses in a string cannot be perfectly managed. The attentiveness of the horse packer, length of the string and traveling pace are all factors affecting string management. less likely to cause damage to the ground, to themselves, and to their handlers. pawed ground should be filled in. to the trails, relaxing around camp or talking to others about the sport. your helmet. When the rider approaches, ask if you need to do anything else. Before starting up again, let the horses get down the trail a bit. with the rider and followed any instructions, pass smoothly and quietly. Once you pass, continue slowly up the trail a ways before resuming your normal speed. information below is borrowed from well respected state, regional and international user group organizations.